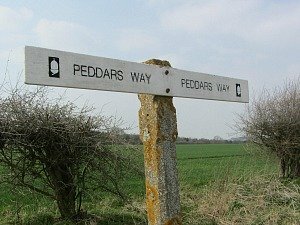 This Peddars Way Blog follows me on my 4 day walk from Knettishall Heath near Thetford to the end at Holme-next-the-Sea on the North Norfolk coast. 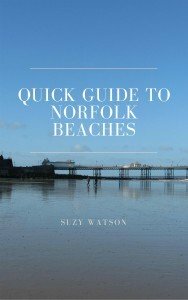 It takes me through pine forests and woodland, heathland and open countryside, tarmacked roads and wide grassy tracks and only four villages to finally reach the complete contrast in landscape of a sandy beach and the Holme Dunes Nature Reserve. 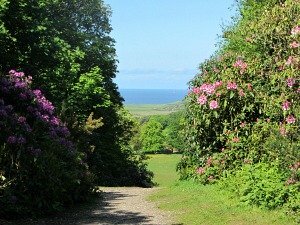 It's a wonderful historic and peaceful countryside trail. I have to say I started my Peddars Way walk with trepidation. 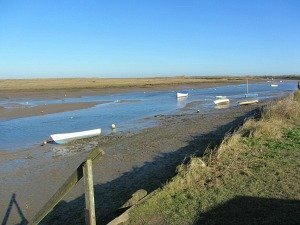 To be honest, I wasn’t entirely looking forward to it, having walked the Norfolk Coast Path and absolutely loved it, the views, the swathes of salt marshes, cliffs etc. 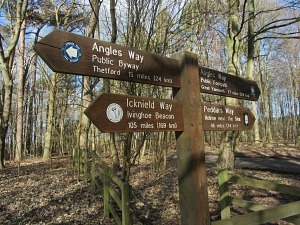 I thought all I’d get here on the Peddars Way was going to be open fields and woodland! I was to be pleasantly surprised along much of the route. The start of the Peddars Way was certainly no fan fair. There’s a small car park and the good old trusty National Trail signs, you wouldn’t know you were about to walk one of the 15 National Trails in the UK. 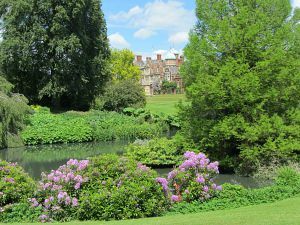 However, it was a lovely sunny day so I was prepared to put all my prejudices aside and take in everything around me as I began the walk. 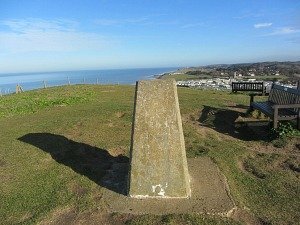 The signage was excellent, telling me that I had 46 miles to the end of the trail at Holme-next-the-Sea, or I could go on the Angles Way and reach Great Yarmouth in 77 miles. That I would leave to another day! 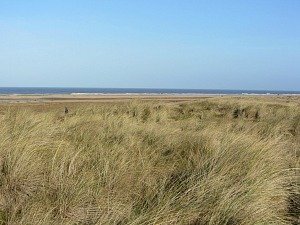 I had decided that I would take my lovely dog, Muttley, with me on this walk, as I knew it wasn’t going to be as tough going as the Norfolk Coast Path, no up and over sand dunes and only finding salty water for him to drink. I knew I’d find fresh water in the puddles all the way along here. 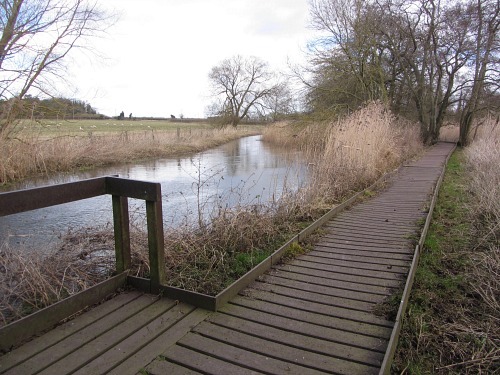 The first part of the Peddars Way long distance trail was a lovely trundle through woodland of pretty silver birch and well-worn paths, reaching a bridge over a small river. Obviously much of this route is along old Roman Roads and therefore fairly straight. Over another couple of main roads and the route varies between large strips of woodland and open flat fields. 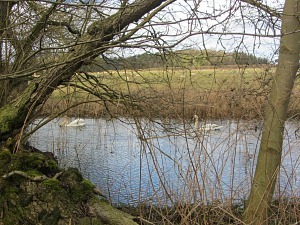 The first bit of wildlife I really came across were two very elegant swans swimming along the River Thet as I walked along the board walk. The board walk was definitely needed as you’d be knee deep in marshy water if this wasn’t here. Then I had the privilege of watching a couple of very young lambs feeding from their mother, reminding me that Easter was only round the corner and that the weather was definitely getting warmer (haha) and the evenings lighter. 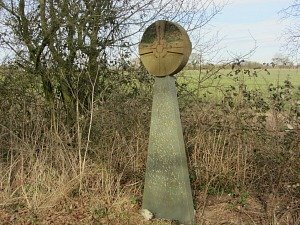 I reached Bridgham (according to a large stone sign), walked through more very pleasant woodland and came out to walk along an easy path taking me into a very different type of wood, that of pine forests. I was now already getting a sense of a very different landscape from that which I’d first started. 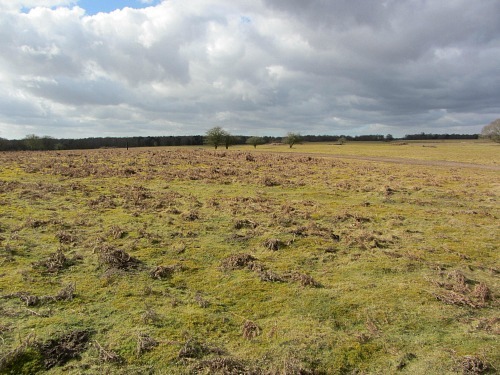 Straight ahead was pine forest, to the left was Brettenham Heath National Nature Reserve, a huge open expanse of heathland managed by Natural England. I think I was going to be in for a walk which has an ever changing landscape along the trail. On I continued, hearing the hum of the A11 dual carriageway getting closer. This road made for interesting crossing. I had to wait for a while until there was a gap between huge lorries and extremely fast cars. I ran over and was glad I had reached the other side unscathed! Ahead lay the railway line running from Norwich to Thetford. 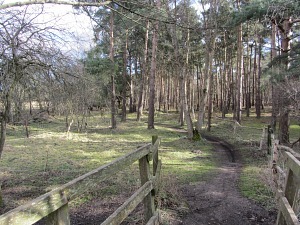 Once across this, the roar of the vehicles gradually faded as I walked on along a wide forest track narrowing into a rutted track with a small farmholding. 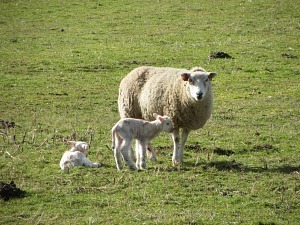 Lambs bleeting away, dogs barking (looking remarkably like Norfolk Terries) and on until I reached Stonebridge. I walked on past the Dog and Partridge pub, but knew that this was pretty much the only pub until you reach Castle Acre, so this stretch is the only one where you possibly don’t need a packed lunch! The next stage was on a very quiet lane, it was extremely peaceful and I think just one car passed me. 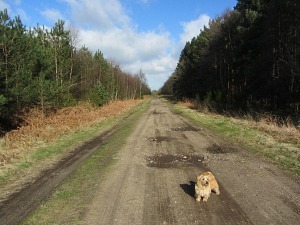 In fact much of the trail so far has been just me, Muttley and the quiet. I quite enjoyed not being on a small mud track for once! 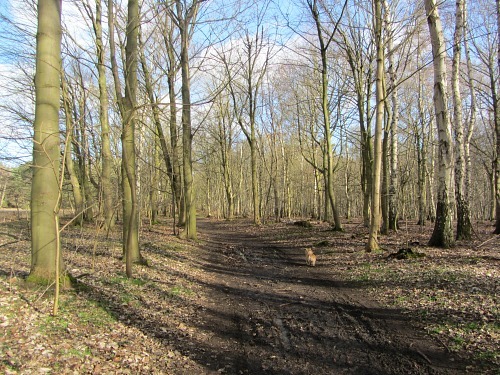 Not long after though, I was back into the muddy tracks heading towards Thompson. 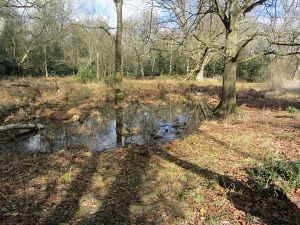 I could almost smell the first pingo pond. 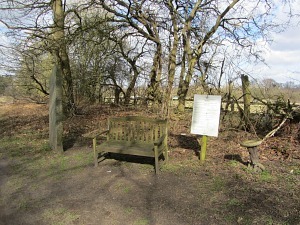 But before I got there I had a well-deserved sit down on the only bench I’ve seen so far, just to the south of Thompson Water and where the first Norfolk Songline sculpture is. I felt I’d reached a milestone once I’d got here. I knew Thompson Water was just a bit further north so eventually pressed on, as I was keen to get a good look at this. 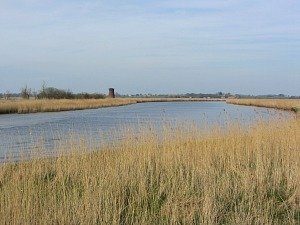 The Pingo trail is a lovely 7-8 mile circular walk in amongst all the Pingos, wetland, swamps and common land. Thompson Water is lovely, serene and very peaceful, surrounded by smaller pingos. 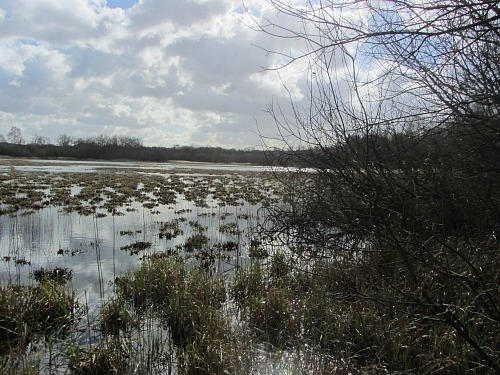 I took a short detour of The Peddars Way and followed the path around to a small hide where I got wonderful views over the Water, a swan preening itself and the sun glistening on the pond. It was a lovely finish to an interesting day full of differing landscapes. 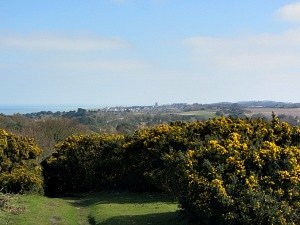 The one feeling I got from today was that it was a very peaceful “country” walk. I wonder if tomorrow will bring the same feelings?